Sixth baby box in indiana now open in Carmel. 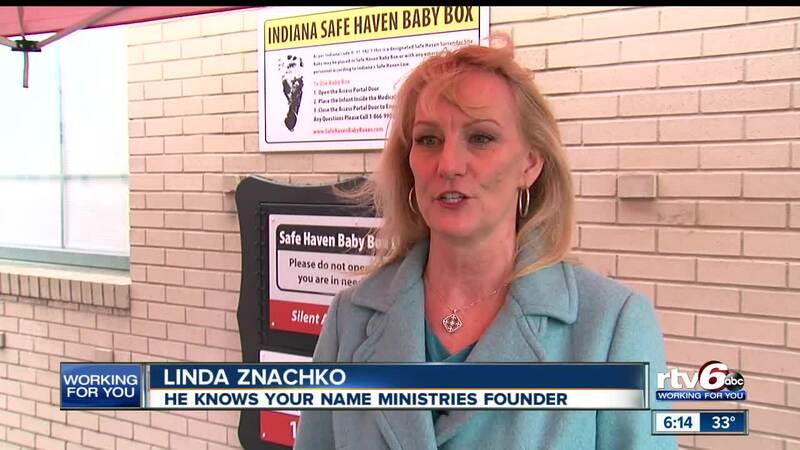 CARMEL — The sixth Indiana Safe Haven Baby Box has been installed in Carmel. The box's unveiling is significant. Four years ago today, was the day 'Baby Amelia' was found dead in Eagle Creek Park. The mother did not exercise her right to the Safe Haven Baby Law. The box is an incubator for parents to anonymously surrender their babies when parents feel there's no other place to turn. Safe Haven Baby Box founder, Monica Kelsey, said this is the last resort for moms. "If she won't walk into the fire station, if she doesn't want to do a parenting plan or an adoption plan — this is a last resort for those moms," Kelsey said. "So we don't find any babies in trash cans or dumpsters again." The Carmel baby box is at Fire Station number 45, on College Avenue, joining the ranks of Decatur Township, North Vernon, Woodburn, Coolspring and Chesterton. "This location was selected due to it's proximity to Interstate 465, Meridian Street, U.S. 31 corridor, Keystone Parkway, Michigan road," Carmel-Clay Township Fire Department Chief, David Haboush, said. Since the first box in Indiana was unveiled in April 2016, two babies have been surrendered. A third was dropped off at the Decatur Township Fire Department after plans were announced to put a box there. 'He Knows Your Name' founder, Linda Znachko, said the mother of the baby was coming to drop the baby off at the box, but the box had not been installed yet. Heating and cooling features ensure temperature management. This particular box is equipped with a medicine box. Kelsey says she started Safe Haven Baby Box because she knows how it feels to be left out all alone. "It feels pretty awesome to be that abandoned child, and now saving abandoned babies," Kelsey said. "And that's important to me because I don't want any child to ever feel unwanted in an unsafe environment, ever again." There's been some pushback with the boxes, but a new law that took effect in July expanded the Safe Haven Law, which allows people to surrender their newborn baby, without fear of criminal prosecution. Baby boxes cost about $10,000 each. The Carmel Baby Box was donated by the Clay Township Donor Board. There are currently 14 more locations in the works for these boxes.